Tanzibar is a sports bar within Aspers casino at Westfield Stratford. What did you think of Tanzibar? All bets are off at this stylish casino bar perched on top of Stratford Westfield. Situated in the heart of Aspers Casino, two storeys up in Stratford’s bustling Westfield shopping centre, the Tanzibar serves as an island of calm amid the frenzy of the casino floor. 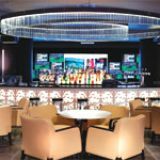 The bar itself is circular in shape and accessible from any angle, surrounded by chunky, cream-coloured armchairs, low marble-topped tables and, further out, endless slot machines and roulette tables – behind the main counter is a wall-sized bank of TV screens broadcasting several sporting events simultaneously, for the insatiable in-play gambler. Approaching the bar head-on, there is no real break with the general casino décor, although the ubiquitous red carpeting gives way to elegant grey tiles – the façade is back-lit and elaborately patterned, and the black pillars on either side, and glass chandelier hanging overhead echo similar installations elsewhere on the floor. 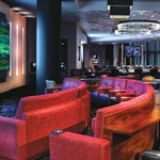 There is limited seating room, and the bar essentially serves as a glitzy refueling point for gamblers in the vicinity. As with the rest of the casino, the atmosphere at Tanzibar is fairly fraught and focused, although things do pick up a little towards the end of the day, and during major sporting events. Needless to say there are plenty of gambling enthusiasts present (the casino is relatively well hidden, unless you know to seek it out up a first-floor escalator), although they are often joined by bemused spouses waiting for their other halves’ shopping sprees to wind down. That said, the general ambience is much more relaxed than some other casinos (no membership is required), the staff are very friendly, and the bar in particular tends to act as a neutral zone in which to take stock of the day's betting, or indeed shopping. There are several insubstantial sandwiches and wraps (£3-£4) for sale in a glass-fronted counter at the Tanzibar, however customers with an appetite should cross the casino floor to the adjacent Clary’s Restaurant, or indeed to one of the many food halls downstairs in Westfield. 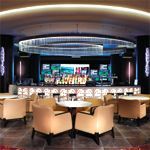 Blending in to the casino with refreshing beverages and a front-row view of the action, the Tanzibar is good for a laugh, unless you happen to be a recovering gambling addict.